From the Sun and Moon to an array of planets, stars, clouds, and charming figures, these designs inspired by the endless wonders of the sky are incorporated into a variety of pleasingly symmetrical mandalas. 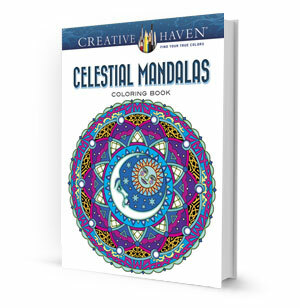 Full of graceful patterns and shapes, each coloring page evokes celestial beauty. A unique opportunity for the experienced colorist, more than thirty illustrations provide limitless possibilities for experimentation. Plus, the perforated pages make displaying your work easy! Thirty-one heavenly illustrations offer colorists hours of creative relaxation. Also features beautifully detailed sun, moon, and star patterns that can be colored.